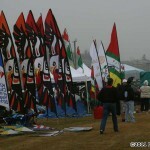 19 years of fantastic kite fun! 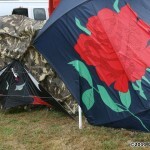 I remember when I first heard about “Brookings.” It sure didn’t sound like much of a festival to me. 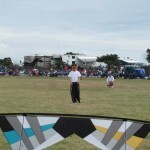 A bunch of kite fliers line up to walk their kites across a field in front of a bunch of old codgers like me. I couldn’t see much sense in it myself, and I had no clue why anyone else would be interested, either. So I actually resisted going to it for a number of years, until I got “talked into it” about three years ago. And now, I wouldn’t miss “Brookings” for the world! I guess that just shows just how wrong I can be sometimes, eh? 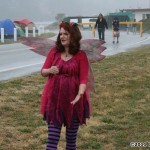 Brookings really is a pretty unusual festival – even unique, I guess. 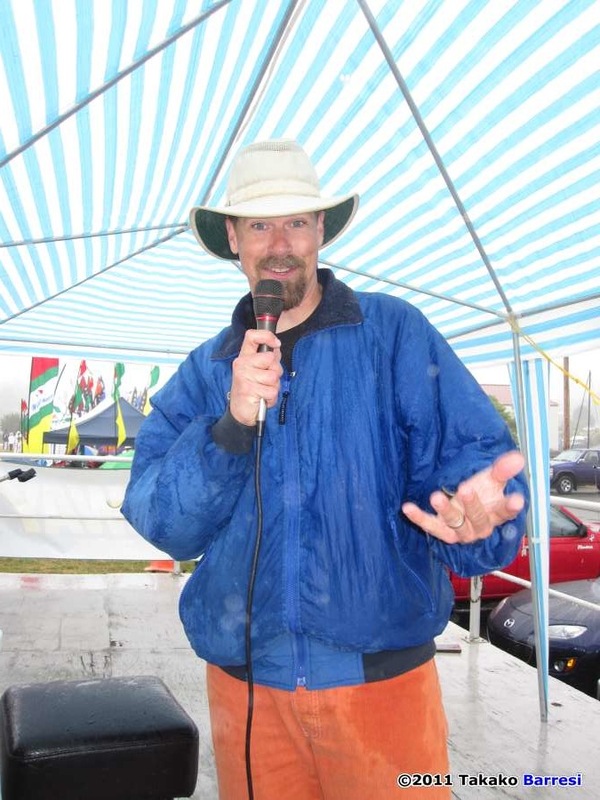 I have heard that Brian Champie’s “San Ramon” festival every Memorial Day weekend is quite similar, but I haven’t been to that festival, so I can’t compare the two. In any case… yup, that’s exactly what happens. 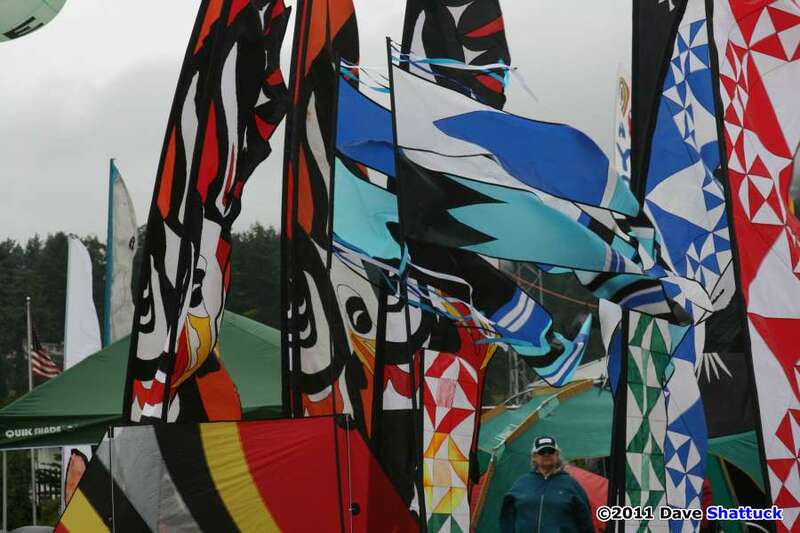 Kite fliers specifically flying kites for the spectators, one routine at a time, followed by the next routine, each routine in succession – all off a “flight order” list… But if you’ve not ever been to one of these festivals before, it all sounds pretty dopey! So let’s examine the concept. No, you cannot stake out your Single Line Octopus and leave it up all day. 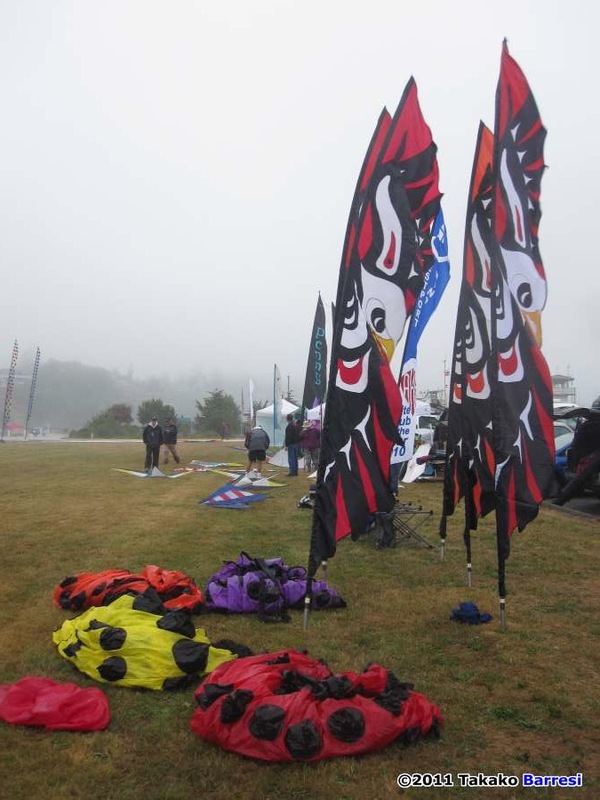 And if you are a sport kiter, there ARE NO competition events in the entire festival – only “Demos.” Okay – then, what are the “plusses” that keep me going back? 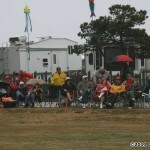 How about a bunch of Single-Line Hand-Crafted Kite-Makers all watching and applauding Sport Kite Routines? 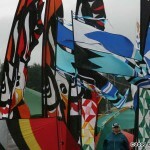 How about Sport Kiters helping SLK kite-makers by towing the SLK kites past the audience? In reality, how about both groups helping each other, watching and participating with each other, and enjoying each other? Indeed, the separations get a bit blurred in Brookings – and we are better kite fliers for sharing the experiences. And, you know what? 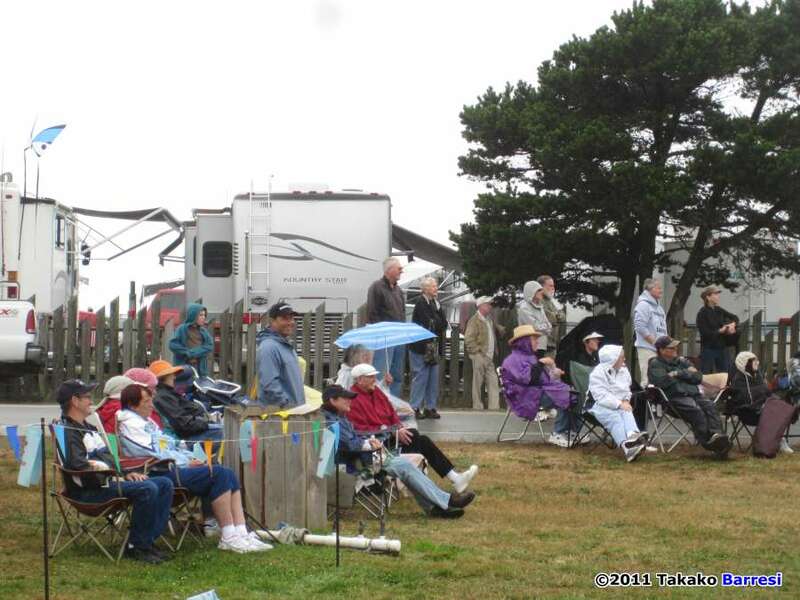 The spectators – the audience – cannot really tell any difference between the different fliers anyway. They just see one display after another moving down the field past them. 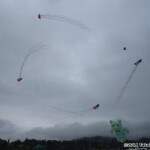 Almost like watching television I guess… A moving “kite show” right in front of ’em – with No Info-mercials! 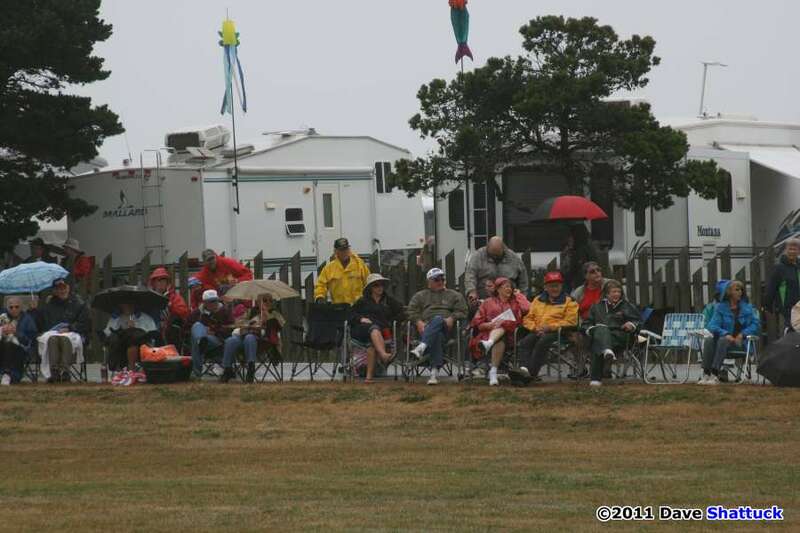 All while sitting in their beach chairs along the side of the field, cheering on their favorites, but they are attentive and appreciative and supportive to all kite fliers. So I am off to Brookings! I do this one solo, since there’s nobody who ants to ride along. That’s fine with me, as it means that there’s nobody else’s schedule I have to pay attention to – and my schedule is simple. I will just be there “when I show up!” So I drive through some of the prettiest country imaginable. That Southern Oregon Coast Range is absolutely lovely! I head for Grant’s Pass the first day, and drive the “scenic route” into Brookings the second day. So as the “Redwood Highway” dips down into California the spectacular scenery is nearly all old-growth Redwoods! Then we turn north again for about 30 miles and there’s Brookings, right on the coast. This year, I very much enjoy having been invited to stay at the home of Gary and Nancie MacEachern, right there in Brookings. 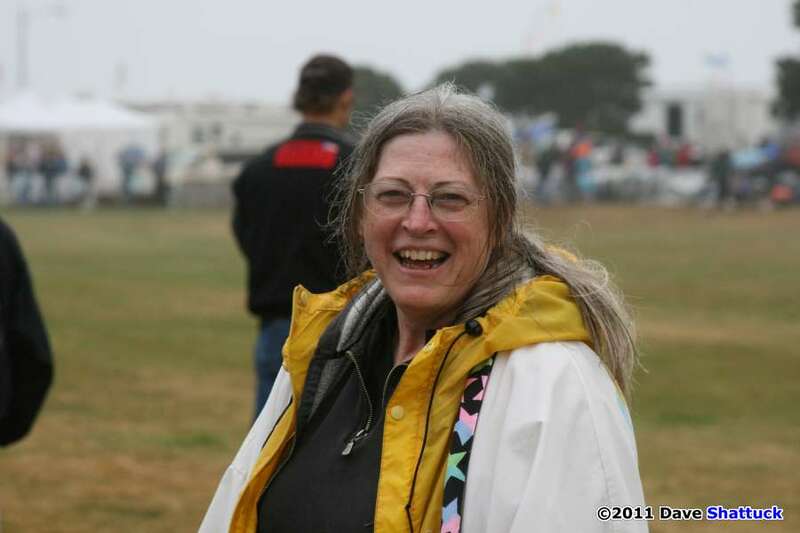 Gary and I have gotten along fine for several years, but while I had met Nancie before, I had not had the opportunity to get to know her much at all. 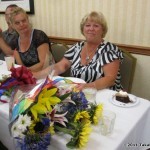 It turns out that Nancie is really a superb hostess, and I felt very well cared-for in their home. So I made it into town and found my lodgings all right, got a superb rest in a room all my own, and headed off to the Oceanside Diner for breakfast with a whole bunch of kite fliers. 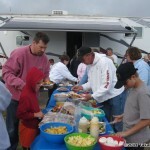 A standard road breakfast slid down easily and I was off to the flying field just across the harbor. The “field” is really a grassy area about 200 yards long and maybe 40-45 yards wide at its widest point, lying roughly Northwest to Southeast. And today, we’re standing around on this grassy area, wearing lots of layers, and feeling a very light precipitation falling. 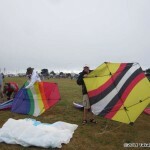 So – not so hot for a kite festival, folks! 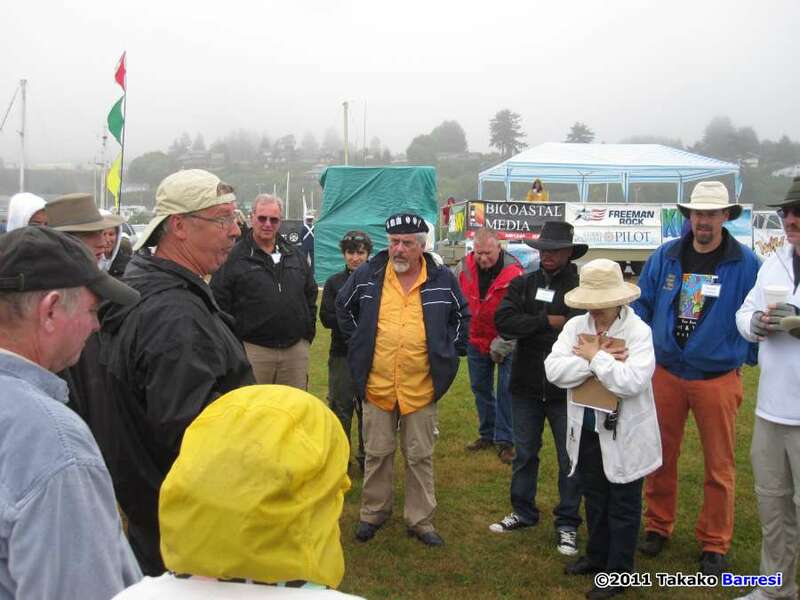 Well, they held the Pilot’s Meeting, and everyone still planned on flying… and 10:00 AM rolled around and there were people in Lawn Chairs ringing the field. 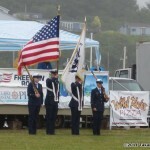 So after the “Colors Ceremony” occurred with the Star Spangled Banner sung, we were underway. Two people aught to be mentioned prominently right here. 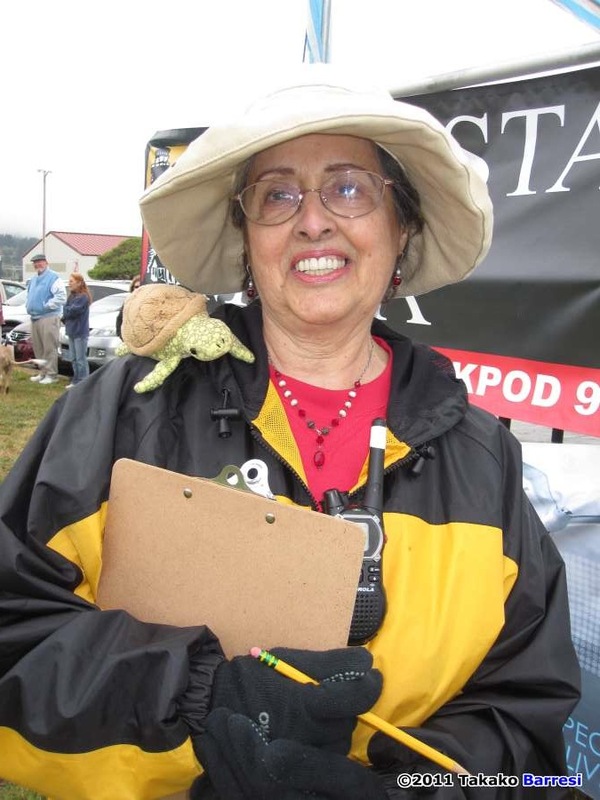 One is Sandy Gibian, the “Keeper of the Demo List” every year and who does just a superb job! 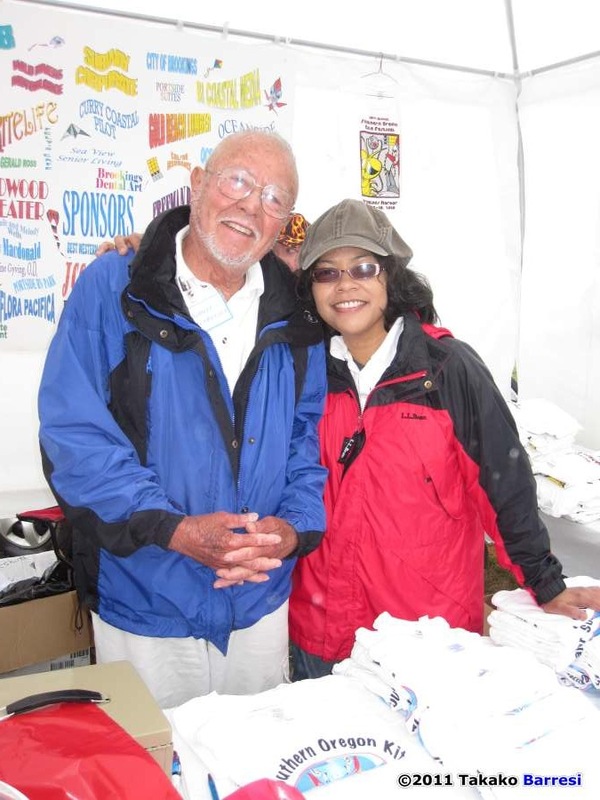 And the other one is Arnold Stellema, our most able announcer who has done enough Brookings festivals that he aught to have his own Director’s Chair with his name sewn on it. Both of these folks are noted and lauded by the fliers and the audience alike for their ability to keep this show alive and rolling! 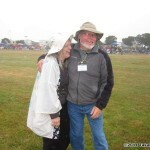 Kudos to you both – fine folks! And as nearly always is the case, Al “The Dancin’ Man” Washington, from up in Portland, OR starts things off with his own special interpretation of some bluesy soul number that he’s taken a fancy to… And, for what it’s worth, Al’s participation is worth mentioning here, because as far as this scribe knows, Mr. Washington has “been there” for all NINETEEN of these Southern Oregon Kite Festivals! Good on ya, Al! 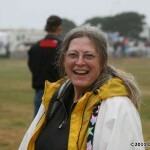 And after Al, the rest of the fliers all stream onto the field, one by one, and give the audience a show, and fly their kites with Joy in their Hearts – in spite of the low wind conditions and the somewhat “damp” conditions of a fine drizzle and a low overcast… And one of the first ones out there after Al is his grandson, Aaron Washington, in for the summer from his family’s home in North Carolina, and spending some quality time with Grandpa! Not to be left out and our “Featured Fliers for the year, the King Family from the Puget Sound area. 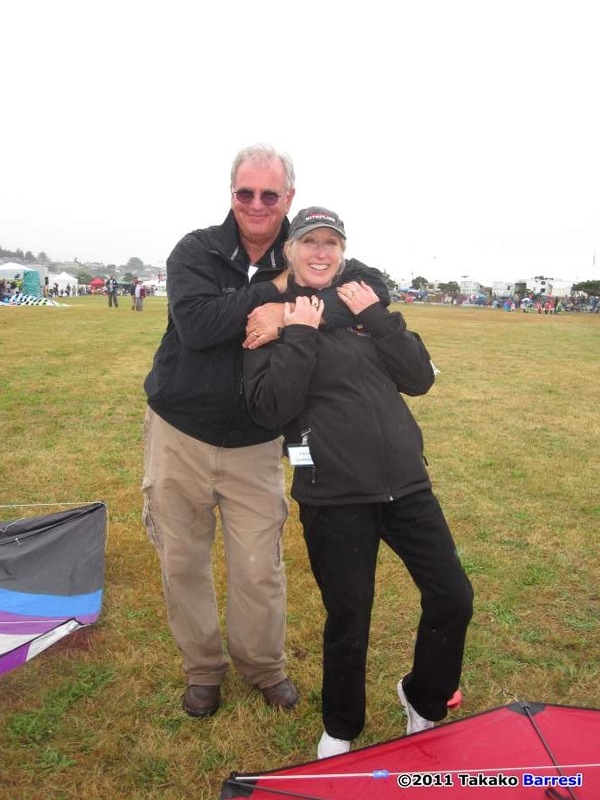 Alexa is a real sweetheart, and son Sam and his lovely wife Cari are equally fine folks – all full of delight with the kites on the field and delighted to be able to participate with this festival… It is their first time at Brookings, and they are already having way too much fun. 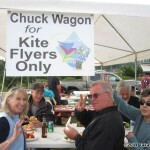 Speaking of “Too Much Fun,” there is an actual kite demonstration team of that name out of Southern California. Team “Too Much Fun” consists of Mark and Jeanette Lummas, and Ron Despojado. 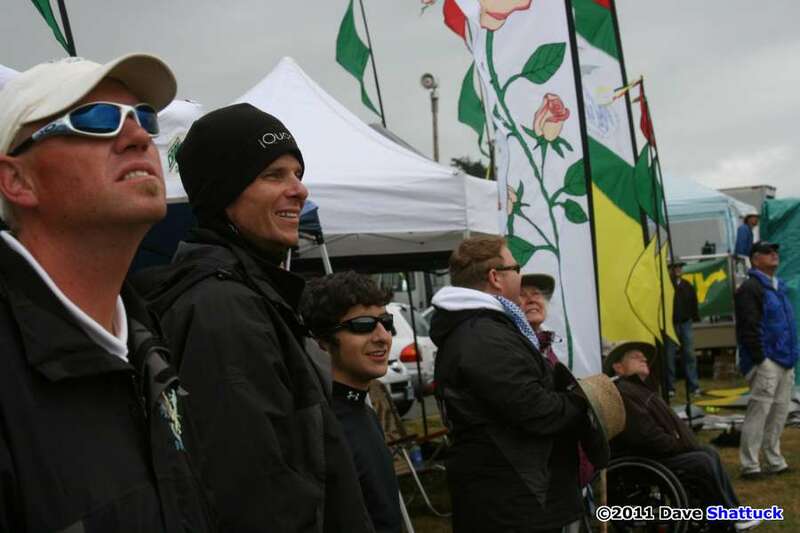 Mark and Jeanette are truly World Championship quality kite fliers, and Ron has six or seven National Championships under his belt as well. 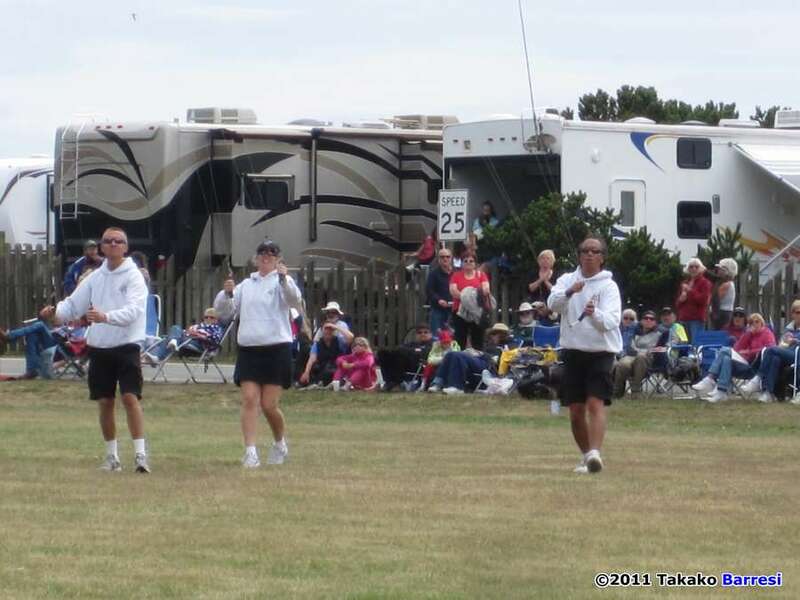 They are (as far as I know) the only team that flies both dual-line and quad-line kites simultaneously in the same routine. They are incredible to watch when they’re on the field. There’s Ron Gibian, of course. 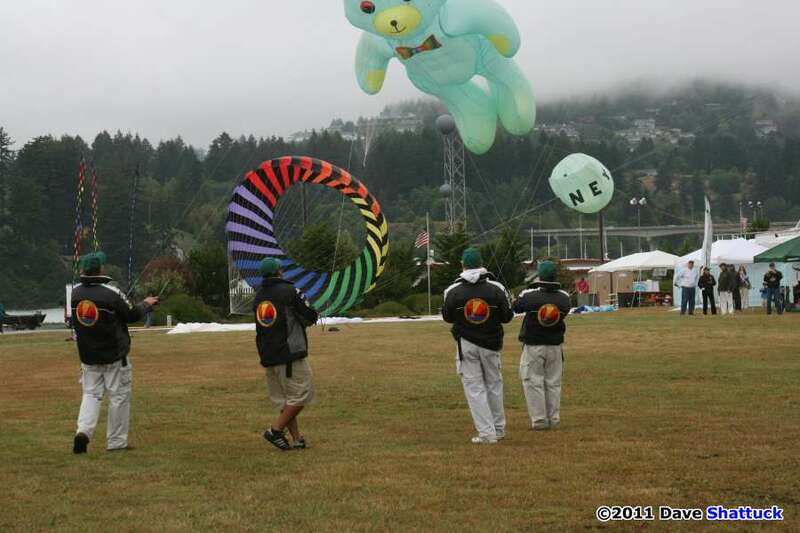 Ron doesn’t talk about it much, but the rest of the pilots recognize him as one of the “driving forces” of this Brookings festival – sort of the “Event Godfather!” Even without Ron’s world renowned kite designs, the help and energy that Ron and Sandy Gibian bring to this festival is well noted and appreciated. And, there’re also that bunch of rag-tag Revolution pilots – iQuad. I’m not certain, but I think they’re missing only Africa and perhaps Australia in terms of continents they’ve not flown on. (There’s still time, guys!) 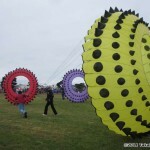 And while “Revolution” happens to be the brand of quad-line kites they fly, they are also completely responsible both collectively and as individuals for the “revolution” in quad-line flying the world over in the last few years. 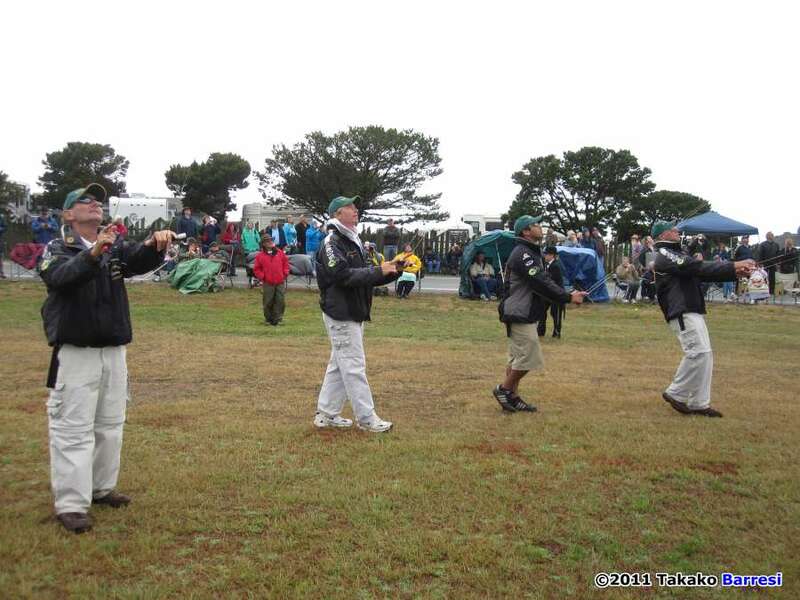 While the individual iQuad members change from event-to-event, the core group of pilots consists of John and Takako Barresi and Steve de Rooy and Barry “Bazzer” Poulter. For Brookings this year, the core group was joined by J.D. 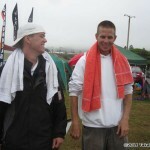 Fabich (“Fabulous,” as our announcer Arnold Stellema calls him), and Willow Robbin to make up a team of six people. Then there are the Dorans! Connor, who did so well on “America’s Got Talent” a year ago, and his mom, Amy Doran, who is a multi-year National Champion in the AKA’s Innovative events, are both accomplished pilots and innovators. 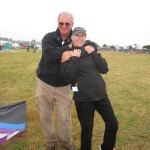 These two are on the “festival” road fairly frequently too – sharing kiting and flying to help in fund-raisers for the National Epilepsy Foundation. They are both accomplished Rev pilots, and are extremely nice people to boot. Of course, we need to mention The Gombergs too. David and Susan are considerable “forces” in the big “Inflatables” kites world, traveling the globe to show and fly and sell their “big stuff.” But Gomberg Kite Productions International also sells “sticked” kites, like Rokkakus and other entrancing small (generally six feet or less) flying creations, and we were blessed with a sampling of both the large inflatables and the smaller sticked kites manufactured under the GKPI label at Brookings this year. 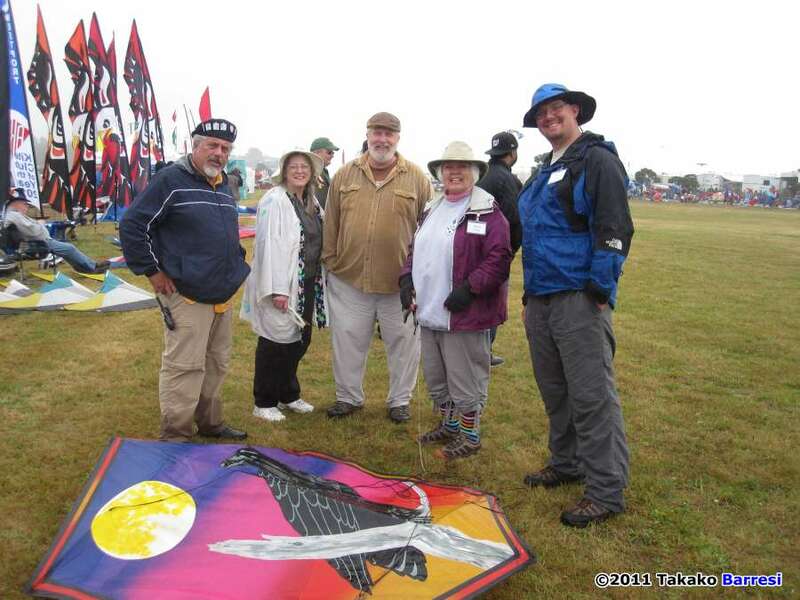 Rod and Cindy Thrall are “custom kite-makers” among other things, and Cindy is a real whiz at all sorts of banners – including some “see-thru patchwork” (vented) banners that are absolutely gorgeous. 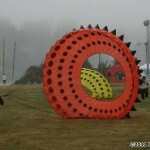 Rod does more of the custom inflatables and more traditional kites, such as parafoils and sleds and other, similar kites. 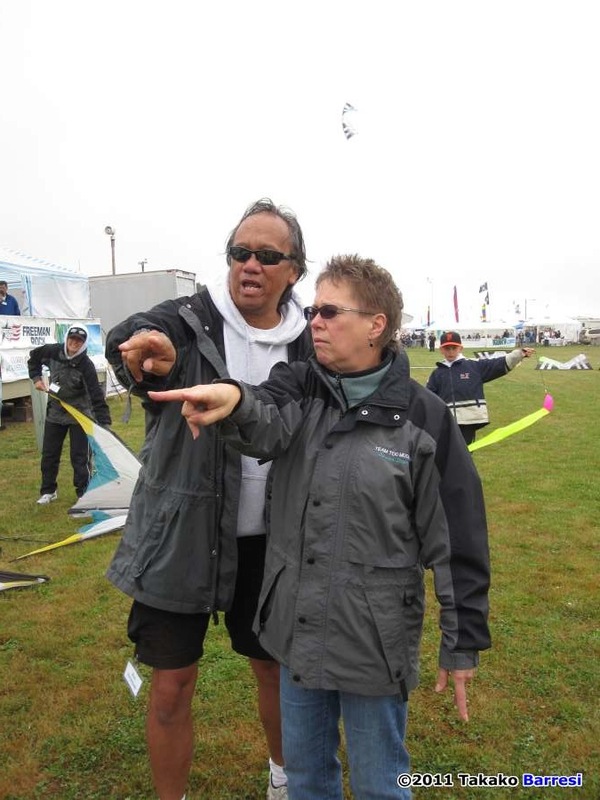 Moreover, Rod and Cindy will graciously help other kite-makers and pilots fly their kites through the kite-field, so together, they have much to offer at any festival. 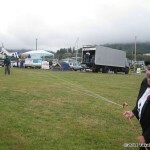 Gary MacEachern is a so-called “local” boy… who currently lives in Brookings, and uses the festival grounds as his local flying field. 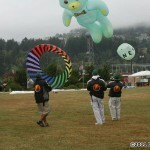 Gary is one of very few pilots in the world who files three kites simultaneously in demonstration routines. 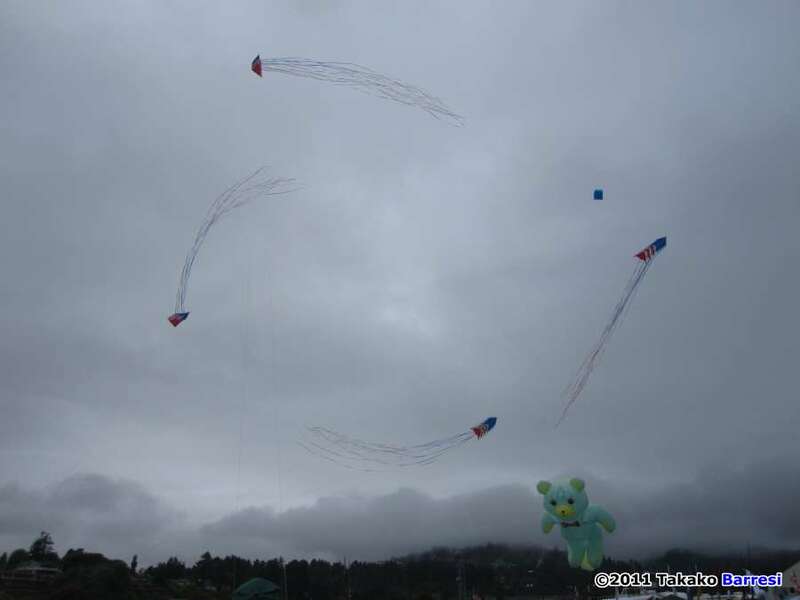 If one kite is a difficulty, and two at once are downright challenging, THREE at once are precarious at best – yet Gary takes all of this in stride somehow. 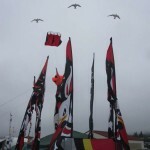 As a well-known kite-maker in his own right (he owns the “Oregon Kite Company”), Gary made three stacks of 16 kites per stack, and he then flew the three stacks, with a total of 48 kites, to a World Record last year up in Lincoln City – and it’s still the World Record to this day as far as I know. 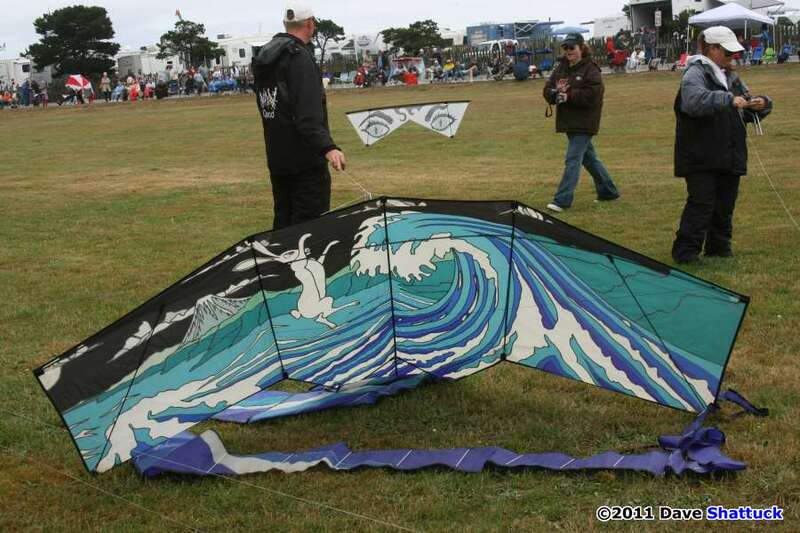 Lindsey Johnson and Ronda Brewer are long-time Oregon Coast residents, and together they own and run Phantom Star Designs, a cottage-industry kite company specializing in Tyvek Rokkaku kite kits and custom wooden line winders, among other things. 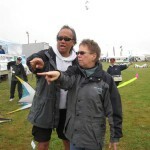 Together they are also perpetual staff workers and attendees at AKA kiting events around the country. 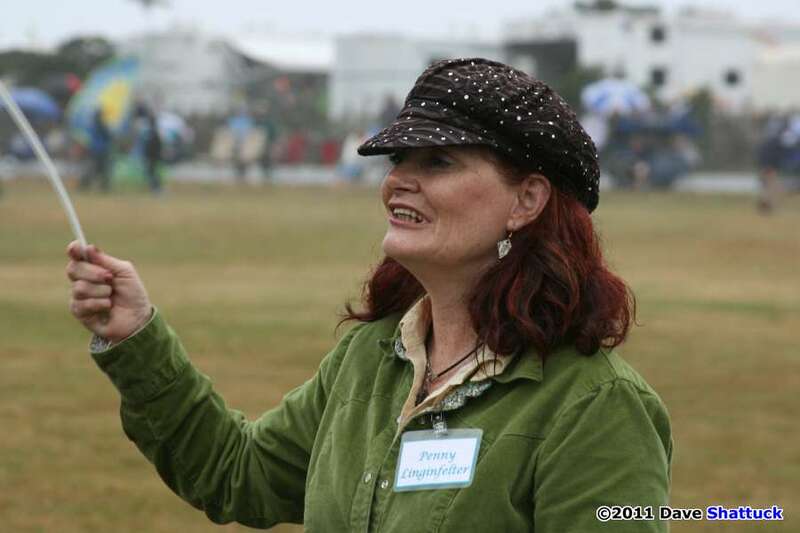 No self-respecting festival could possibly be complete without Penny Lingenfelter from Port Orchard, WA and her “cast of thousands.” Penny is a VERY GOOD indoor Rev pilot, but is best known for her, what she terms “Skits,” which we all call extravaganzas! 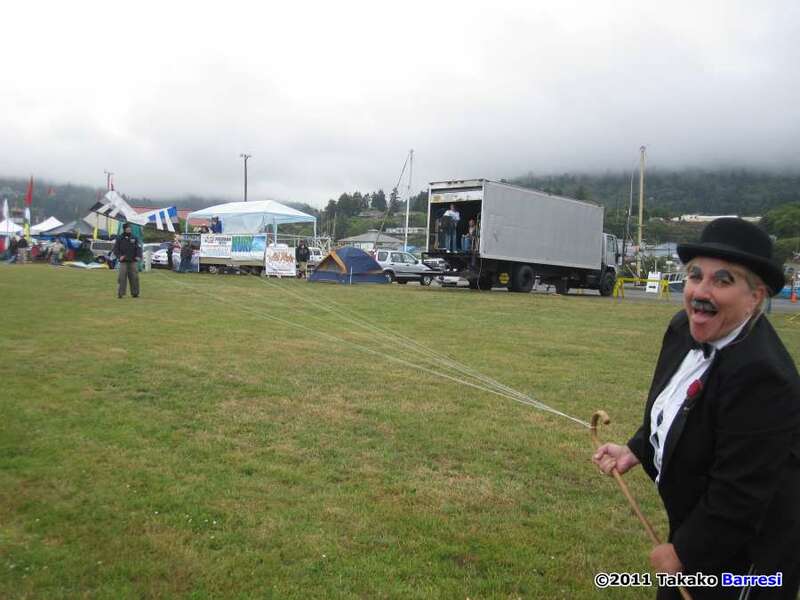 She goes out into the crowd, and with the help of the event announcer, she recruits children (of ALL ages) to help her put on her display-skits – which consist of “Penny and Company” filling all available space on the field with kites of about a gazillion colors, all flying to the music of her routines. The “skits” might feature Dr. Seuss (say, Cat In The Hat, or Green Eggs and Ham) or Peter Pan complete with Penny as Tinker Belle, or some other well-known children’s tale. Sorry folks, there’s just no describing these huge “extravaganzas” of Penny’s. These’re “Ya just GOTTA see it” affairs! Then there’re a couple of other “locals” to note as well. 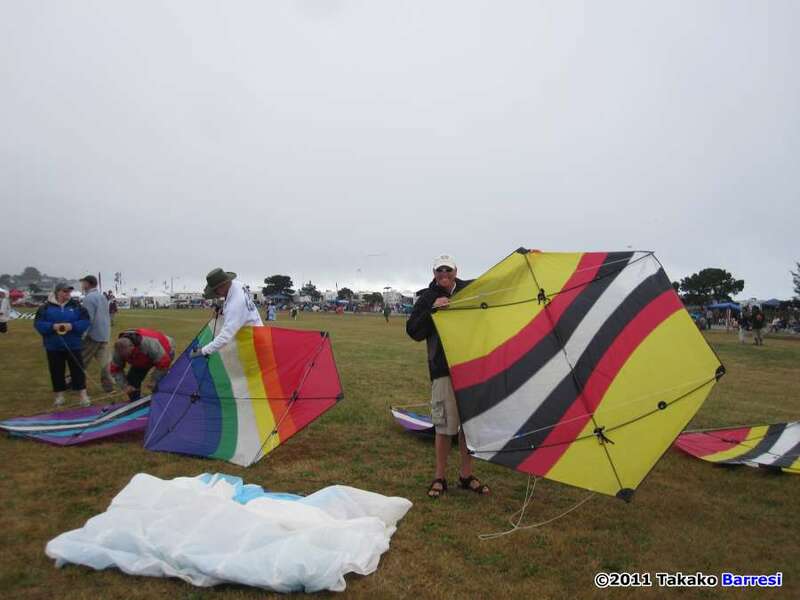 Al Stroh and Susan Shampo are delightful folks originally out of San Diego who used to drive up to the Southern Oregon Kite Festival every year, but they recently sold out of So-Cal and moved permanently to Brookings – ostensibly to cut short their commute. 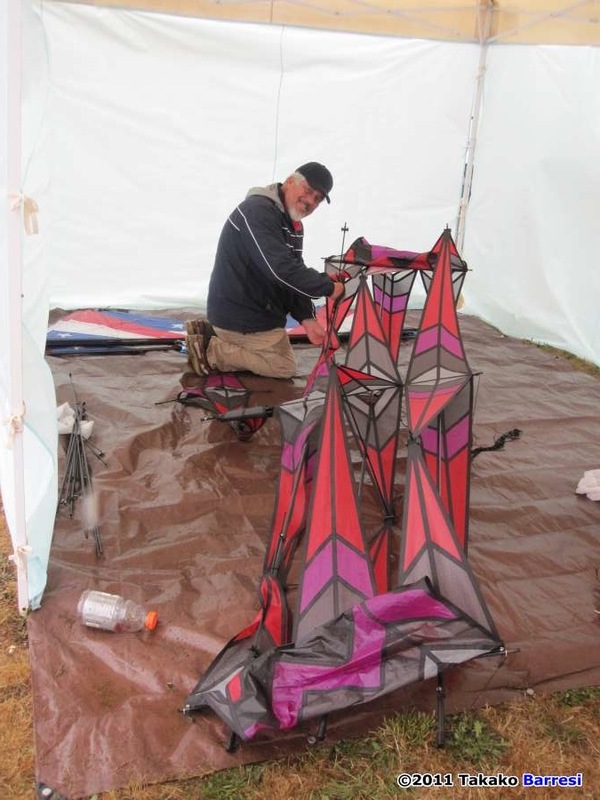 Alan is a long time dual-line Sport Kiter who has gradually shifted over to fine single-line kites. That delights Susan, who has absorbed many of Alan’s better dual-liners and Susan still does a VERY creditable job with one in her hands. Together, they are a couple of the reasons I delight in coming down to Brookings every year! And, then there’s Nathan Ostovar. Nathan is a young kite flier who attended Brookings with his dad a few years back, and decided that he wanted to learn to fly kites. 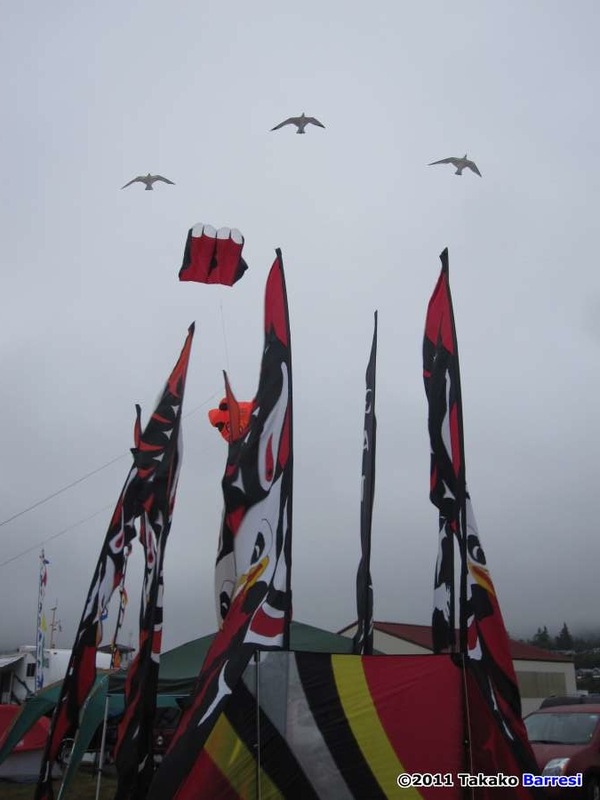 So he approached some of the fliers at the festival – who set him up with a kite and then taught him to fly it. Well… Nathan is a good enough pilot now that he’s back every year and taking his turn in the Demo rotation now, and doing JUST FINE, thank you very much! 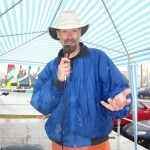 And finally, last but certainly not least, there’s Steve Blasdell. He’s a pretty darned fine Rev pilot these days, but that’s not close to the half of it. 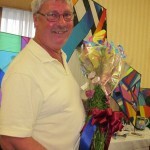 As co-chair (with Peggy Freeman), Steve is “responsible” for all of this. Getting enough vendors for the vendor-row. Setting up the field and the stage. Providing site security. 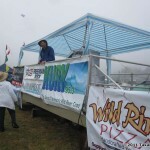 Getting enough staff to manage the info booth and festival office. Getting invitations out for all the fliers and then obtaining lodgings for everyone and taking care of the finances… Yeah – the whole shebang! It’s a wonder he’s even standing upright once the festival begins. We enjoy seeing him fly his Rev, but we also figure it’s only his due, after all. 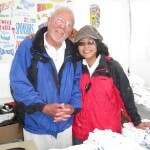 Without Steve and the other folks like him, there would BE no festival. 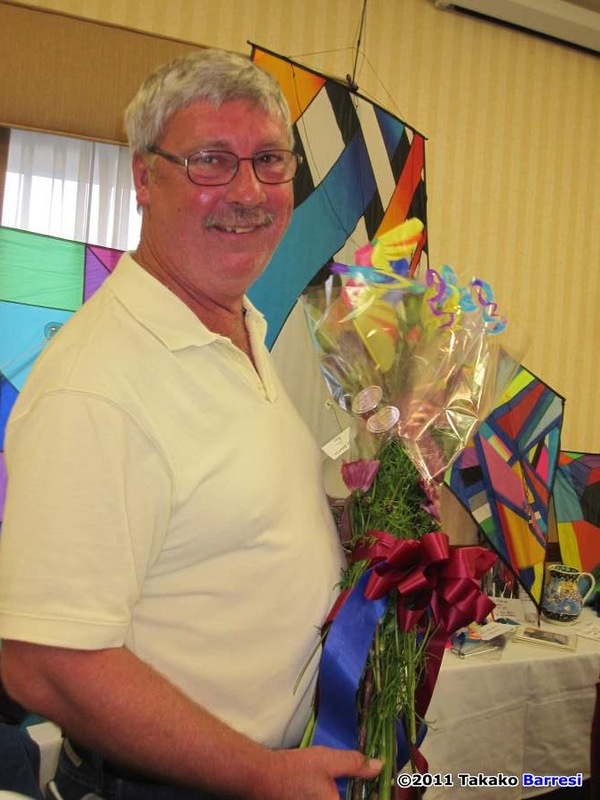 From the bottom of our hearts, Thank you, Steve! 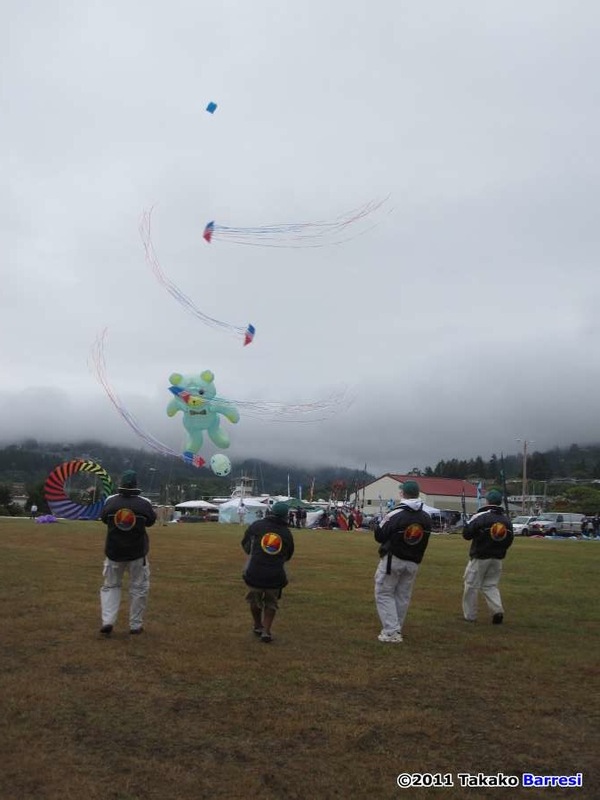 And a huge “Thanks” to for Peggy Freeman, Steve Blasdell, and the entire Southern Oregon Kite Festival “Committee” for all that they do to further kiting in their community. We certainly hope we bring as much joy and delight to their community as they provide for us in putting on this wonderful festival. 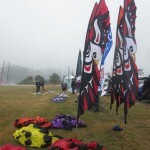 We kiters appreciate all they do very, VERY much! Well… (Did I miss anyone?) 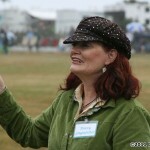 So, it’s still drizzling a tiny bit… Sandy Gibian is putting her list together. Arnold Stellema has the tunes cranking and the fliers flying in the sequence that Sandy has them laid out on her list… one right after another. 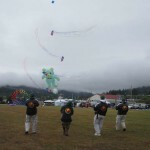 So the Southern Oregon Kite Festival is alive and rolling along, with separate pieces of it being held together by different people. It’s right about when iQuad is getting rolling for their first “set” and it’s still dampish-enough out that I’m still not too interested in getting the camera all soaking wet at the moment, so maybe now is a good time to just grab the travel-mug and go find out which of the vendors has a cup of coffee to sell… and I’ll check out the rest of the vendors too, and see what’s of interest this year… so I do that. 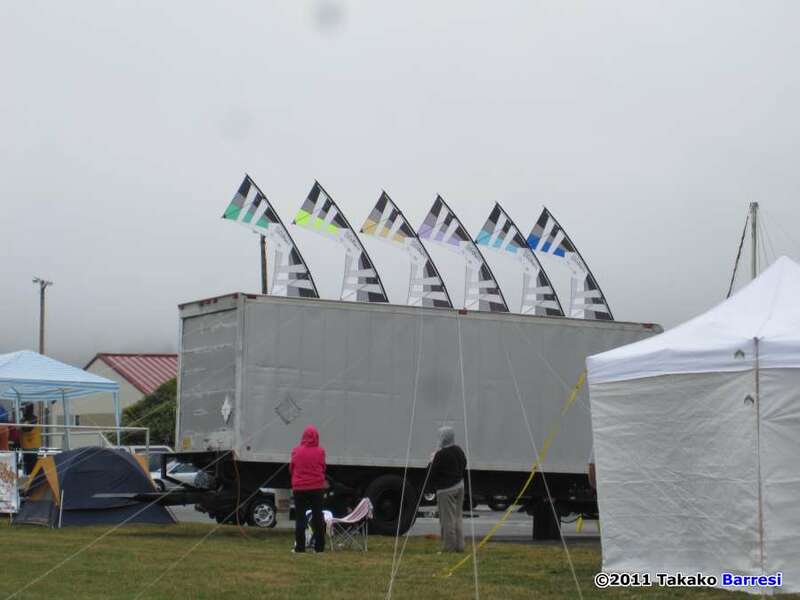 Who goes to a kite festival – in the rain – and buys fancy, high denier cotton sheets – from festival vendors? Well, apparently enough people do to make it worth the vendor’s while… but that’s not for me either. I pass! The gal selling necklaces and earrings in an American Indian motif, using real turquoise and red coral (not plastics, and not manufactured stones, either) has some interesting, attractive stuff. Unfortunately, all of my peasant blouses have gone to rags long ago, and I’ve never had my ears pierced either – so I don’t qualify for her wares. Ah-HA!! Someone selling coffee! I don’t even remember what their primary items were (beef, pork, hot-dogs, chicken?) – just that I spotted a coffee urn, and bought myself some. Typical “vendor” coffee, but when you’re standing out in a field with the droplets slowly oozing down your back, being “choosy” is kind of senseless… Do want the darn coffee or not? I did – so I bought! It all went down okay, one sip at a time, and it was palatable and not overly expensive either. Good enough, and I have what I came for… time to head back to the field. Anyhow, the audience – small and somewhat “soggy” though it is – seems to be enjoying the show, and so are the fliers, of course. 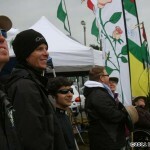 So the “Demos on Sandy Gibian’s list continue, Announcer Arnold keeps trying to find new words to introduce the same people on their second and third times out on the field, and different presenters put up different kites, or perform different routines, and the viewing crowd is suitably enthusiastic. 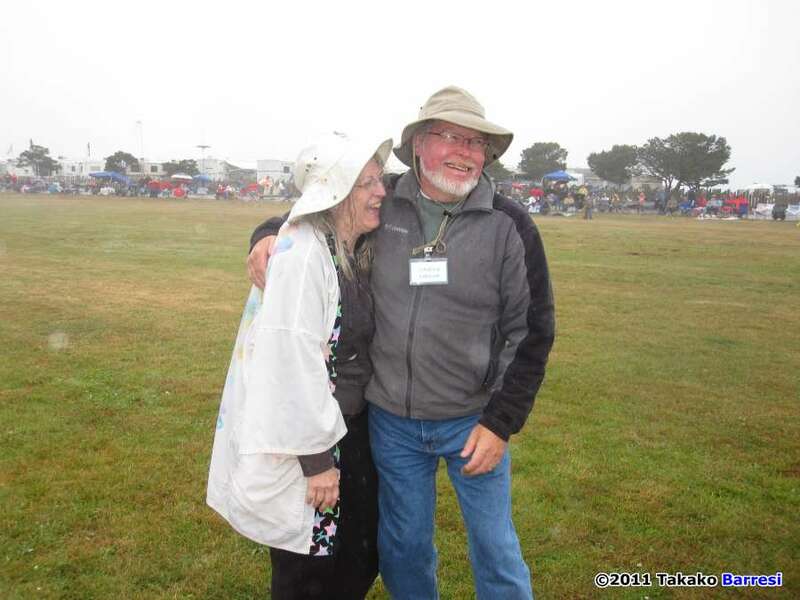 But there are also plenty of rain slickers in evidence now, and some of the beach chairs also have sheets of plastic covering them if their owners have gone to lunch or are wandering over in the vendor area. And finally Arnold breaks away from his normal routing to announce that lunch for the fliers is available up at the kitchen pavilion at the North end of the field. I don’t know if anyone has mentioned the emphasis that the Brookings organizing committee seems to place of food, but other festivals could certainly learn some things about feeding their invitees from Brookings. When I’d arrived in town yesterday afternoon, the other fliers all seemed to congregate at the flying field. And along about 6:00 PM, I was surprised to find there was a Barbeque for the incoming fliers laid on right there at the field. So we all had a pulled pork sandwich or a large hotdog, and some salad, and cold drinks were all available. Yep – even dessert. I had a piece of Apple pie! It was a VERY nice touch – especially if you were into grilled oysters (which I am not). 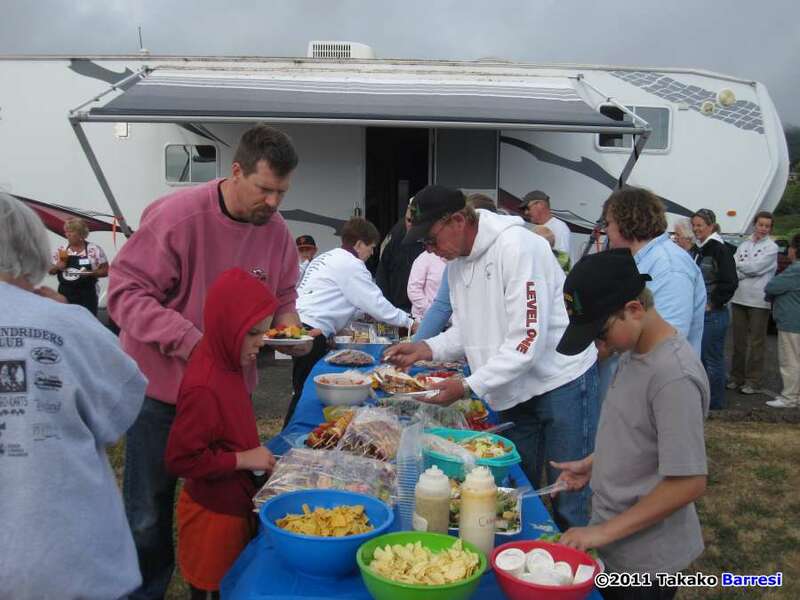 Anyway, on both Saturday and Sunday, the festival committee had more food available for the fliers’ lunches, served at the same area of the field. Yes, it was “picnic” food certainly, but very well prepared, quite filling, energizing, and satisfying. And it was nice to be able to go eat, and if it was your turn to Demo, you had only to walk down the sidelines, pick up your kites, and go perform your demo or put up your display. Someone had done their homework a while back, and this was the result. GOOD on you, Brookings. 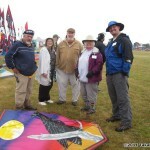 So – once lunch was over, we all returned to what we do best… Flying kites! And the precipitation finally dried up so the field began to dry a bit, and the winds picked up another notch too. 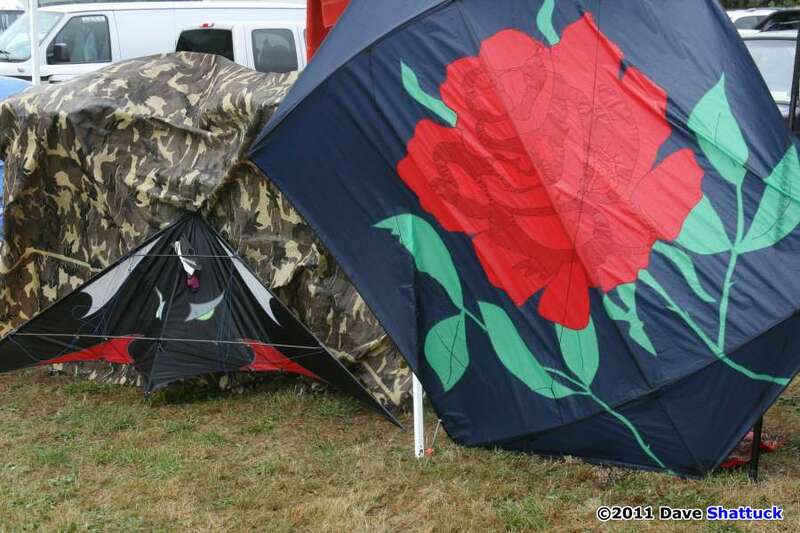 So while I’d shot some photos earlier, I walked through the various “camps” along the flier’s side of the field and tried to get some sense of how the fliers perceived the festival at this point. So – on through the afternoon. I am certain that Steve Dr Rooy flew two Revolutions at the same time. I am sure that my pal Gary MacEchern put up at least two and maybe three kites, and flew them to some opera or other… I am positive that the King family put kites into the air, at least well enough for a walk-thru past the audience across the field… And I know that Ron Gibian also provided a little display or two of his own as well! Amy Doran dressed up as something special (Charlie Chaplan? Mary Poppins?) and flew for the crowd. 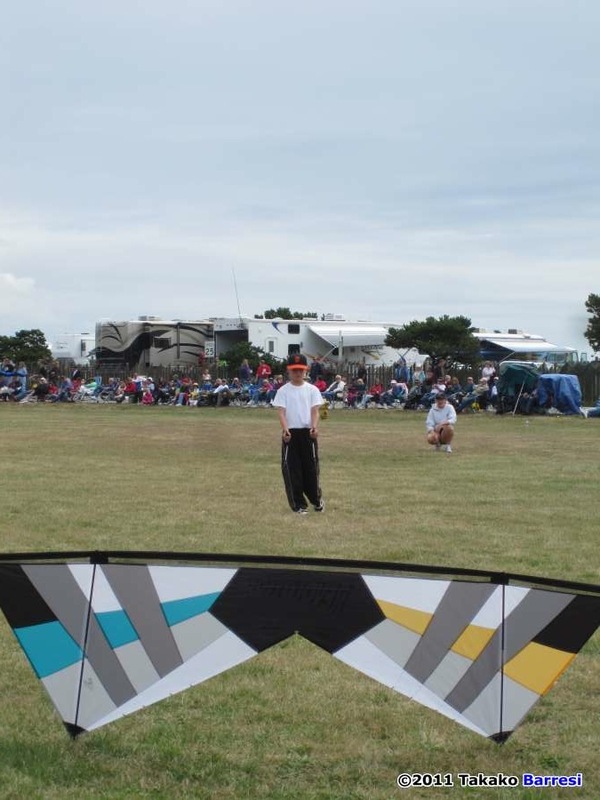 Team “Too Much Fun” flew for the crowd as well, then came back as Ron Despajado sols – separate from Mark and Jeanette Lummas, who fly together as “Bi Dance.” And John Barresi undoubtedly flew at least two individual demos – one with his Rev quad-line, and another with his new “Kymera” dual-line kite. 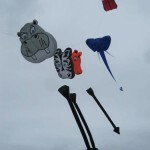 And I do believe that the Gombergs put up a bunch of Rokkakus, and some other wind-toys too! Yes, the afternoon passed. Demos were flown. 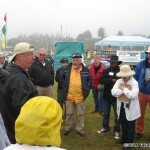 Shows and displays were planned/launched/walked-through… The spectators certainly got their money’s worth. And everybody’s temperament slowly improved, right along with the gradual improvement in the weather. Sandy’s list never got down to zero, and Arnold never ran out of the good words. Instead, we ran out of both wind – and time. Yes, the wind took a little holiday and began to die off, but that was okay. We all needed to get cleaned up anyway. 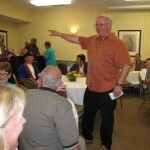 We had a banquet and Auction to attend tonight. 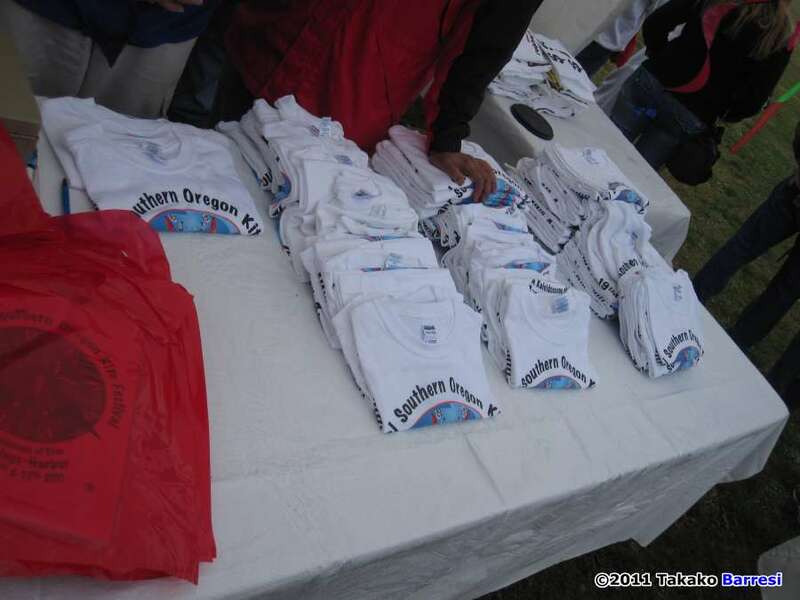 Time to fold ’em up and pack ’em away. Tomorrow’s another day. So, we all went back to our lodgings and “freshened up.” Washed faces. Took showers. Changed clothes. 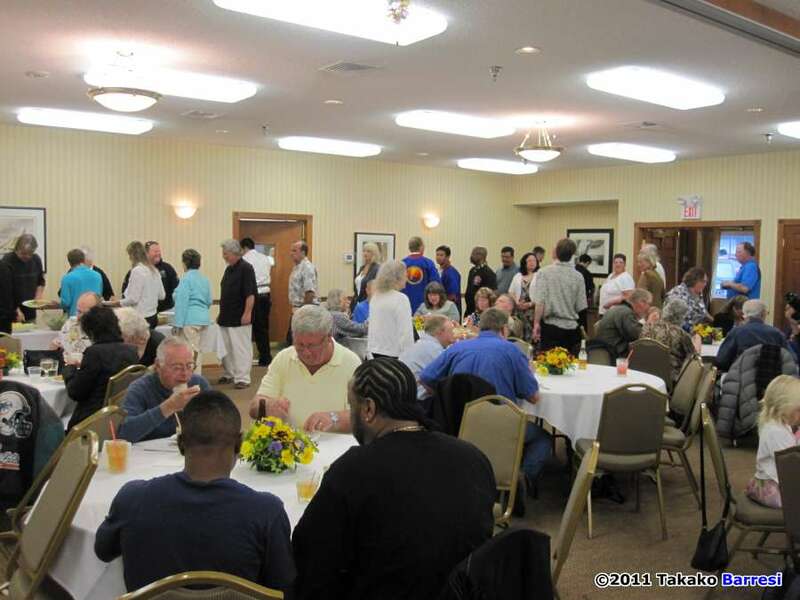 Then we came back to the Best Western just around the corner from the Flying Field, and had our Banquet. Ah… there are Banquets and there are banquets. But this one is actually worthy of the name. The food was very appropriate, in adequate amounts, and very well prepared. Believe me, I do not say this lightly – but this one is “special,” right down to the chocolate cake! Nice room, too. A no-host bar. Plenty of Coffee – Tea too! A very nice auction it was too, with VERY nice items to bid on. 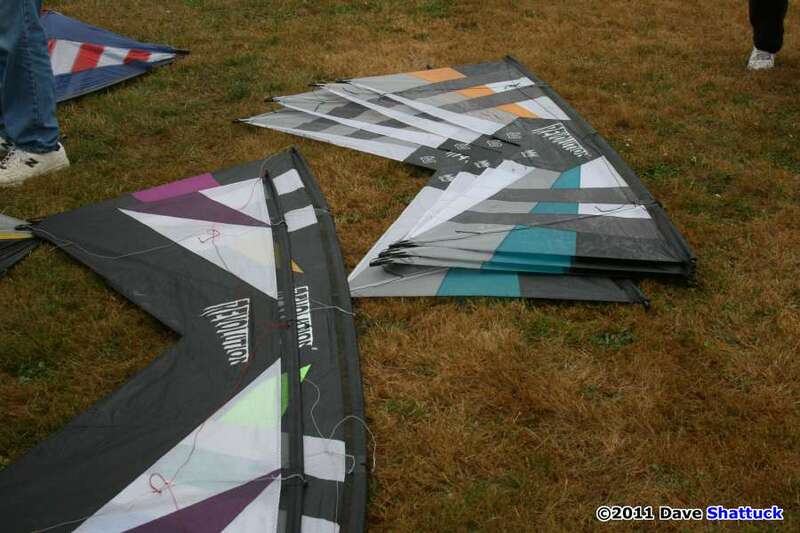 Some rare kites. 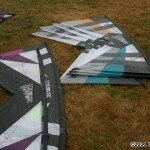 Some new kites. 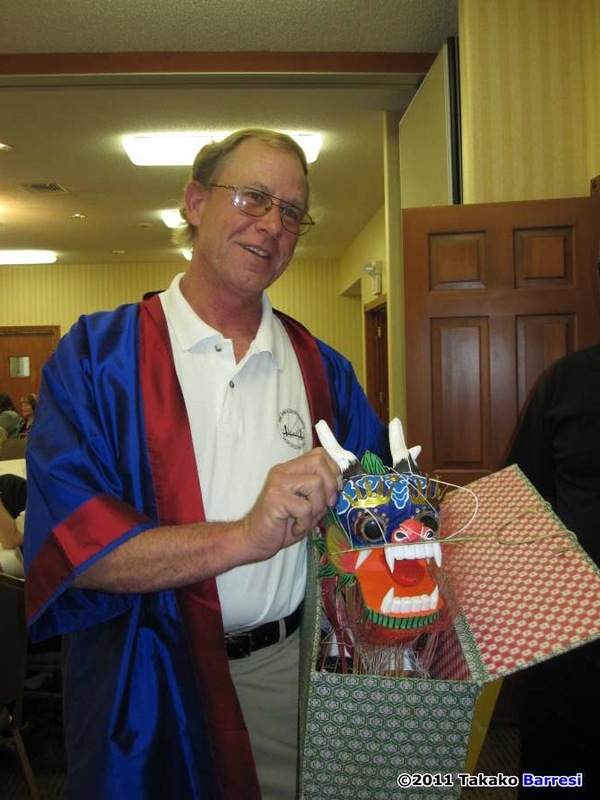 Everything from kite-pins to local raft trips, and hotel stays, and rounds of golf. 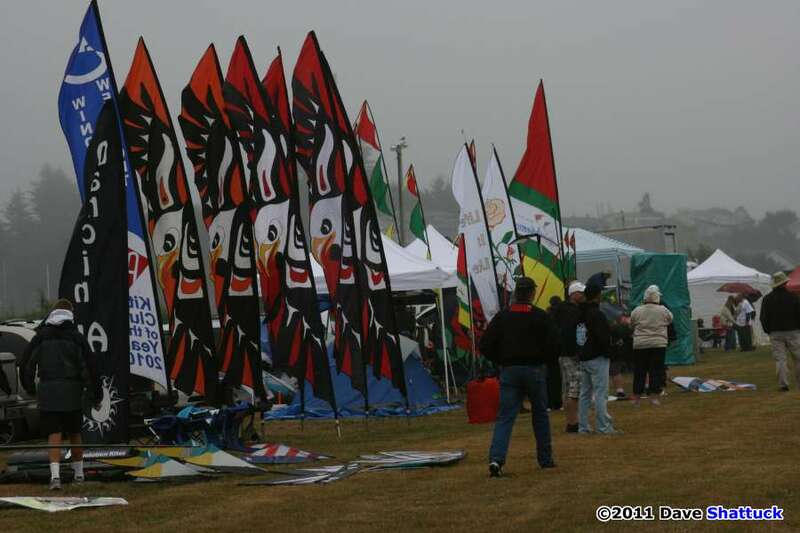 But mostly a bunch of very nice kites. 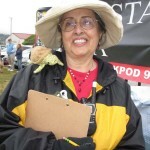 I won two items – I won a “Bay Area Sundowners 30-year Anniversary” pin. 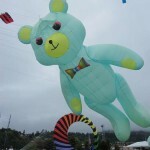 And I won a very nice small genki kite made by Alexa King, and I suspect, made especially for this auction too. 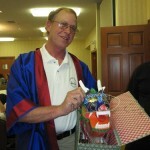 A great meal, a fine auction, and excellent camaraderie too. And then it was back to Casa MacEchern for a good, restful night’s sleep! We’re gonna do it all over again in the morning, folks! And so we did, too!! Yes, Sir! Gary and Nancie make GREAT coffee in the morning! I am MOST beholden, fine people. Then it was off to the Oceanside Diner again. Another fine “Standard Road Breakfast” which couldn’t be beat! I got smart and stopped at the latte stand right across the street from the diner and grabbed a full-bore “drip” to go. No more hunting through the Vendor Area for coffee. Oh, yesterday’s coffee was all right – but just all right too. Now I have a GOOD’un! Then, off to the field. 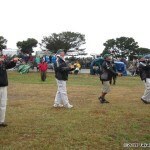 Basically, we were faced with the same weather conditions – only minus the “weeping” precipitation this time. We all thought we’d prefer a dry day, so that was A-OK! We still heard the same basic instructions in the pilot’s meeting – fly safe, have fun, help each other! That’s kind of a basic no-brainer, really! And then at 10:00 AM, we were right back into the old routine again. 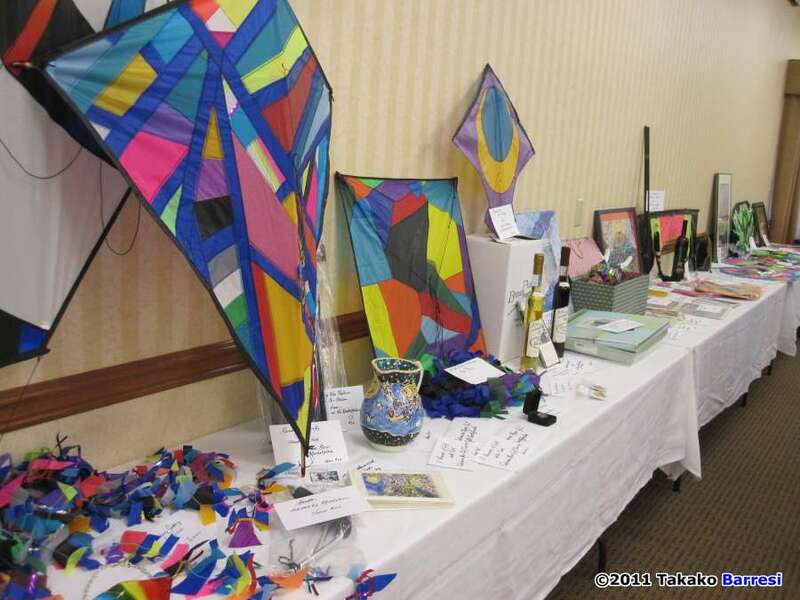 So having not much to do other than sip my coffee, I wandered over to Sam King and asked him about the kite he’d donated to the auction last night. We’d talked a bit about the kite after the auction, and Sam had said it was an easy kite to build and inexpensive, and offered to build one for me. Come Sunday morning, I just wanted to make sure we had a working agreement, and that he was serious about his willingness to do it. Well, he said he was serious about building one for me all right, but he as NOT willing to accept any money to fund the necessary materials for the effort. All right, Sam – we’re good! Then it was back to watching Demos and presentations again. Various acts and displays and Demos. 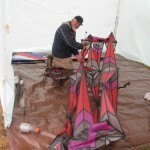 I think Lindsey Johnson showed us his “Zegalope” Dela Porta kite. 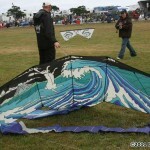 And I’m certain that John Barresi gave another demo of his new “Kymera” dual-line kite. 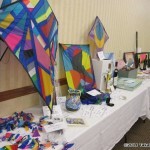 Ronda Brewer brought out 3-4 of her hand-painted Tyvek Rokkaku “kit” kites. 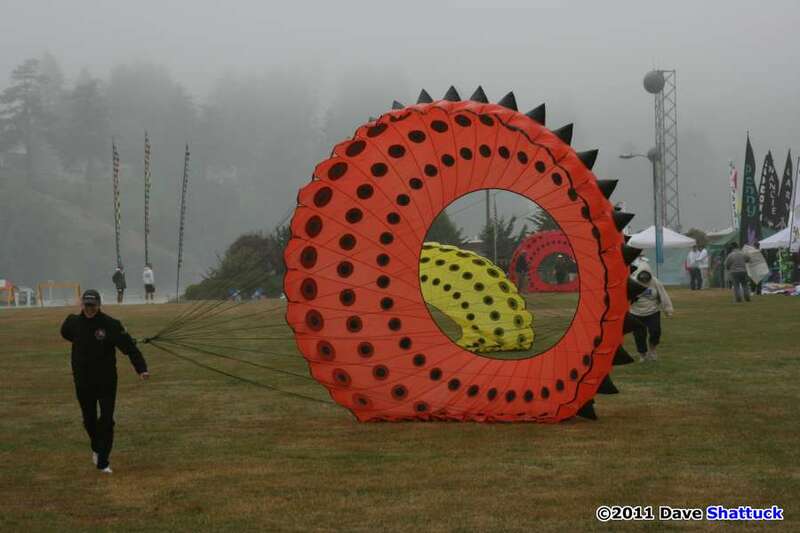 And Ron Gibian assembled his awesome “Calypso” cellular kite, and several people were in awe at the loveliness of that kite – myself very much included. 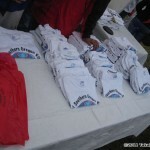 But by and large, the presentations and Demos occurred about like they had on Saturday. Oh, yesterday’s attendance was down a bit from the norm we’ve seen in prior years anyway, and Sundays always seems to attract about a half to two-thirds the number of spectators that we see on Saturdays. I suppose it’s the combination of church-going people, and out-of-town folks getting ready to head back home that shortens the Sunday supply of an audience in attendance. Still, we had a decent and appreciative though small-ish crowd to “show off” for today, so it didn’t change the routines much at all. And, in the early afternoon, the hoped-for prophesy actually came to pass – the overcast began to dissolve and we could see our pal, the sun, again. By now, you’re probably thinking that I’m just one of those silly “Sun Worshipers” who glories in sunshine and that’s the end of it, right? Well… NOT SO!!! Sunshine on the Pacific Coast affects the winds, and the more sun we see, the better the onshore winds generally are. 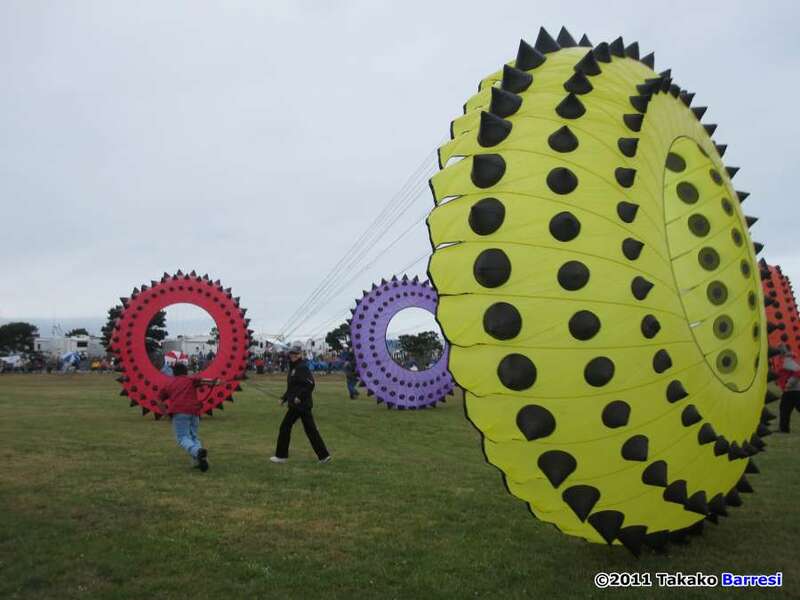 And for a fest like the Southern Oregon Kite Festival that is generally “wind starved” to begin with – every bit of sunshine we can get is “golden” (and yes, I DO mean the “play on words,” there). Let us revisit a concept. 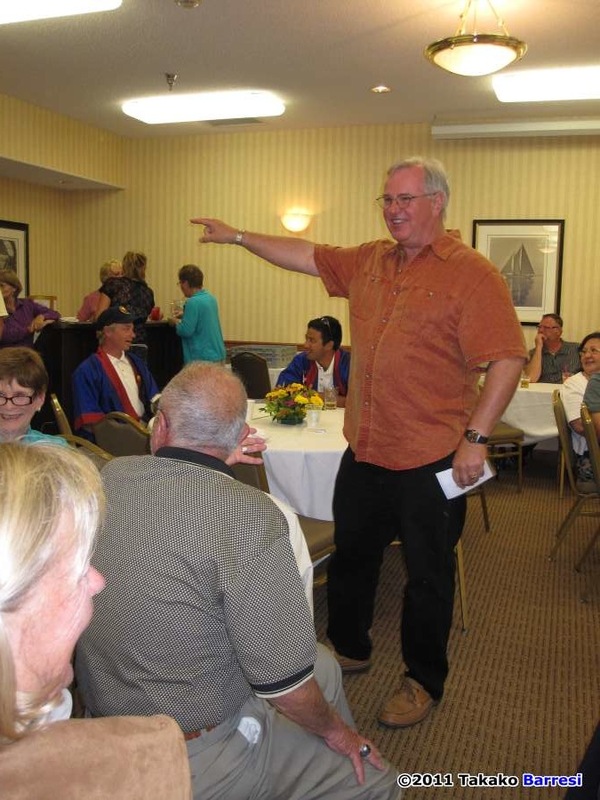 I have mentioned earlier that the Bay Area Sundowners absolutely LOVE to come to Brookings to play with us – and we are always delighted to see them, too! But for the Sundowners, Brookings is a “tough” place to fly. 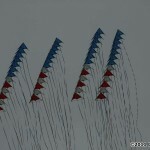 Their kites need WIND! Now, a quick “caveat,” here… Those figures and approximations in the paragraph above are all really just “guesses” on my part. Don’t hold my feet to the fire or hire any attorneys to initiate court proceedings to prove me wrong… They’re just guesses, folks. 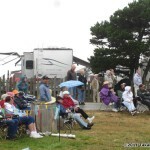 So anyway, the Sundowners come north from the Bay area every year, knowing that they love this festival to death – and then there’s a flip of the coin chance that they might even get a chance to fly – IF the wind really cooperates… Well, so far the wind hasn’t cooperated much at all. 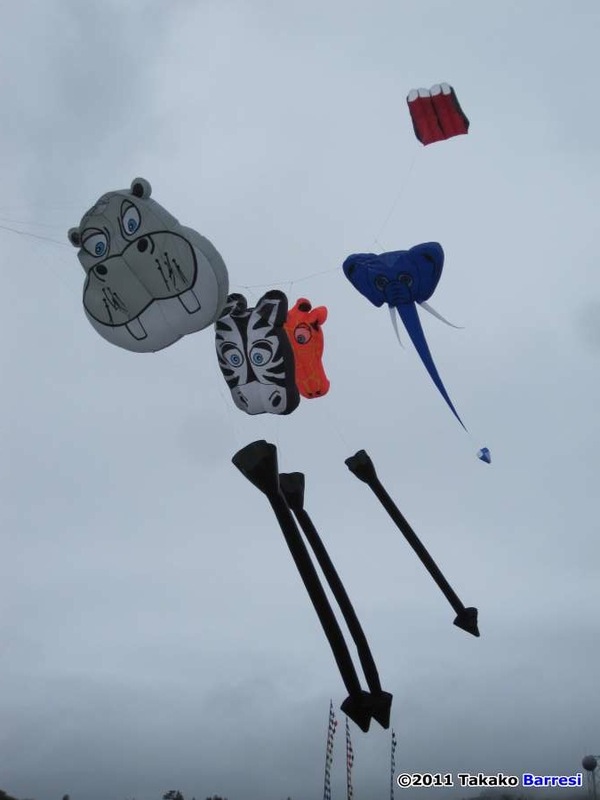 Oh, they dragged a kite-set out on Saturday and tried… and the wind just wasn’t very darned helpful. 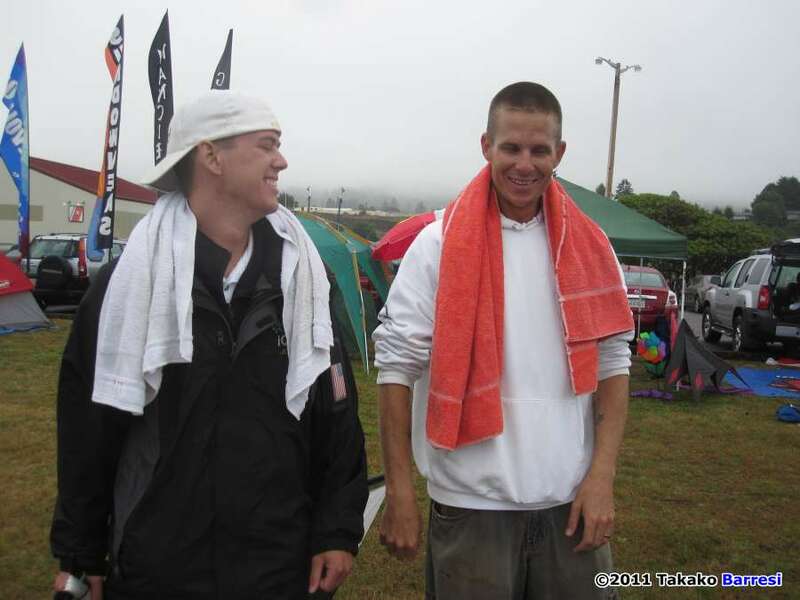 All they got for their efforts was a stack of wet kites, which got all rolled up again and “put up wet.” Not good! These guys would like nothing better than to FLY!!! It is what they came north to do! 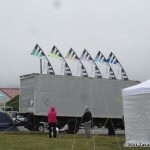 And we have to note that roughly two out of three Brookings festivals they attend – the Sundowners are faced with the same difficulty – NOT ENOUGH WIND! And out of all that, you can begin to see the logic behind our “Sun Worship.” More sun, generally means more wind, which in turn means an increased chance that the Bay Area Sundowners will actually get a chance to FLY!!! And are we rooting for that to happen? Ya, sure, you betcha! 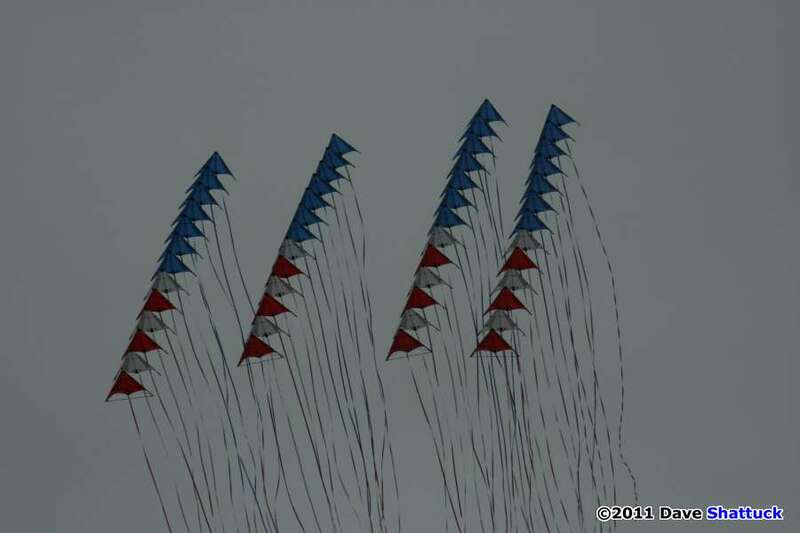 Well, to cut this nonsense short here… The sun came out… The winds increased… Gordon Osterlund and crew pulled out a set of kites and “tested” again. 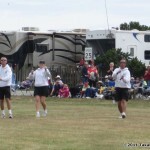 Looks like there might actually be enough wind for a “show” folks… Let us get ready, just in case! 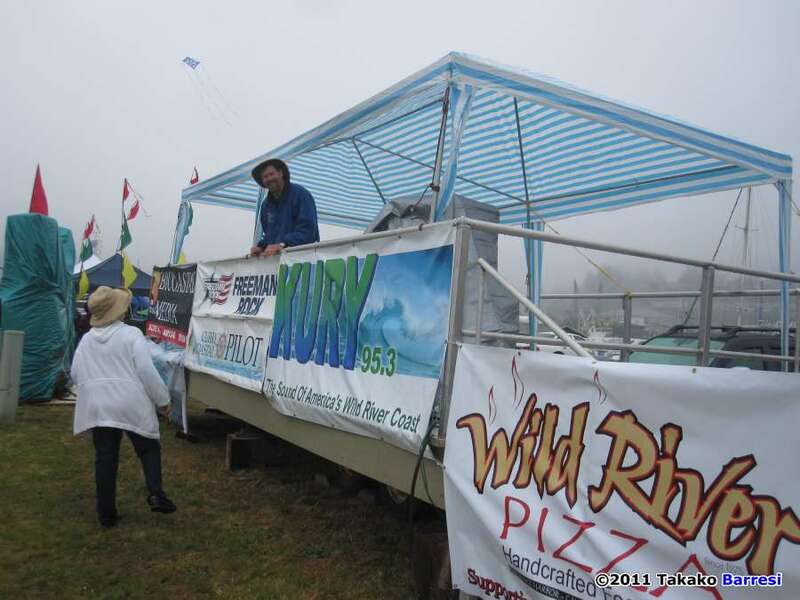 Which they did… And folks like Sandy Gibian and Arnold Stellema got the word early on… If the Sundowners said “GO” – everybody else got their kites out of the air and off the field immediately. So… after all this HUGE build-up… did the Bay Area Sundowners actually get a chance to FLY? Well, I ain’t no dummy. I wouldn’t have gone to all this lengthy explanation if they did NOT… They most assuredly DID FLY! BOY, DID THEY FLY!!! 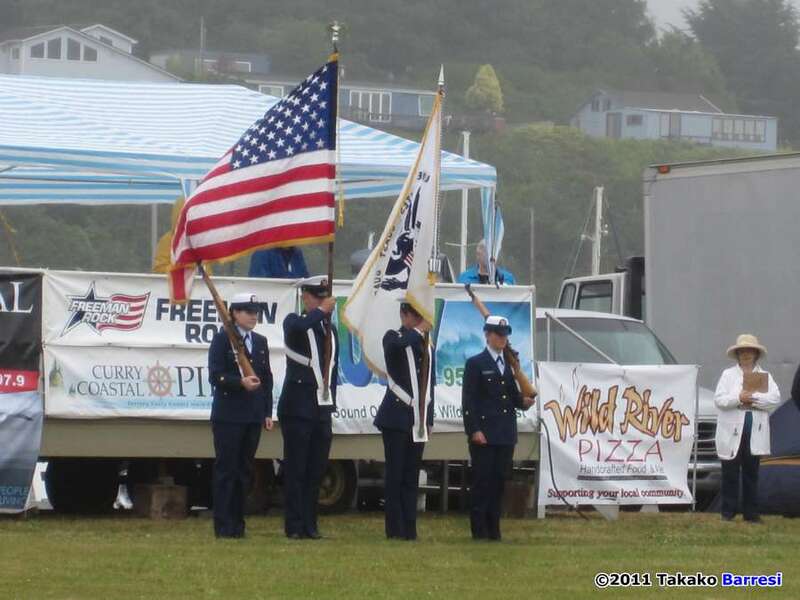 The kites’re in the air, and the patriotic music they fly to is blasting out over Brookings Harbor, and what little audience we had are simply awe-struck – on their feet – cheering! Oh, boy! This is just plain GLORIOUS! 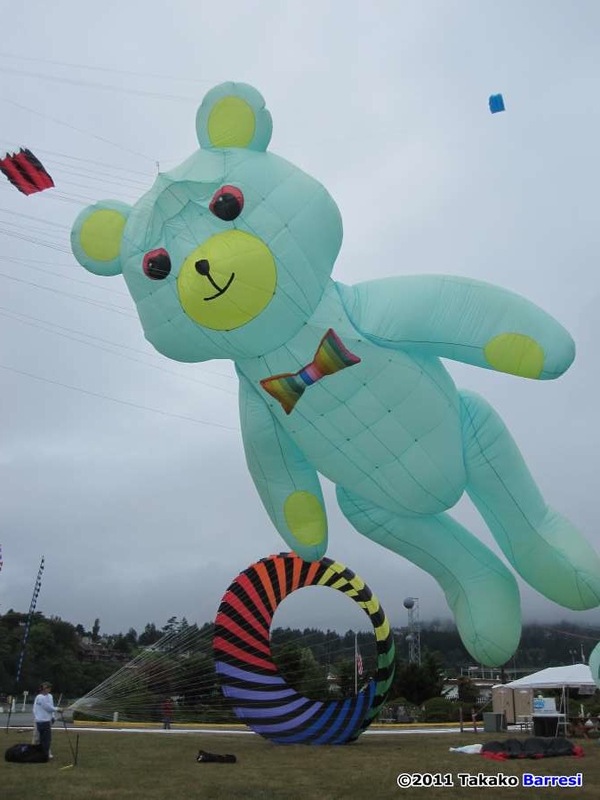 But finally, with the pilot’s stores of energy depleted, the kites came down in straight lines and settled onto back to the grass again… And the crowd – what there was of it – went wild! THANK YOU, BAY AREA SUNDOWNERS!!! I can assure you that I was NOT the only one wiping my eyes after that most-excellent performance! What a perfect way to end a very fine 19th Brookings kite festival! 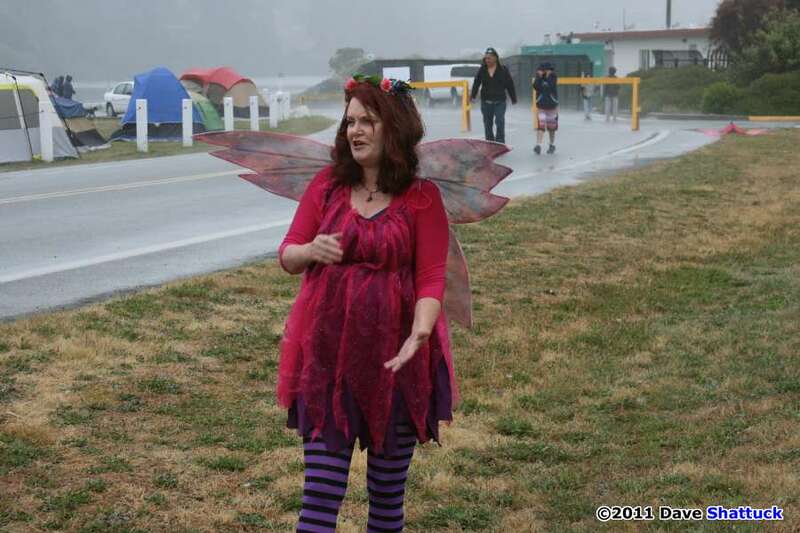 Oh, there were other people who flew on, mostly for their own “recreation” at that point – but the festival was essentially over. Pack it up and put it away. There ain’t no way anyone is going to top THAT performance! It’s something to savor… Just think – THIRTY YEARS, the Bay Area Sundowners have been doing that kind of incredible flying! It’s simply Amazing!!! 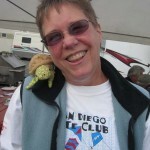 All right, time for clean up, tear down, stow away, and to rearrange everything in the vehicle for the long haul home. And all the fliers and the staff fell to with a will, and after an hour or so, everything was mostly cleaned up. Time for us to get up the hill to the Wild River Pizza place for scrumptious pizza (excellent) and all the fixin’s, including a glass of boutique beer or two. Time to say “Thanks,” and give and get Hugs, and share a final kite yarn or two, and maybe swap email addresses and phone numbers. And if you don’t fill up on Pizza and Chicken Wings and Salad at the Wild River on your own, you have no room for complaint! It was certainly there for you! Will I be going to Brookings next year? 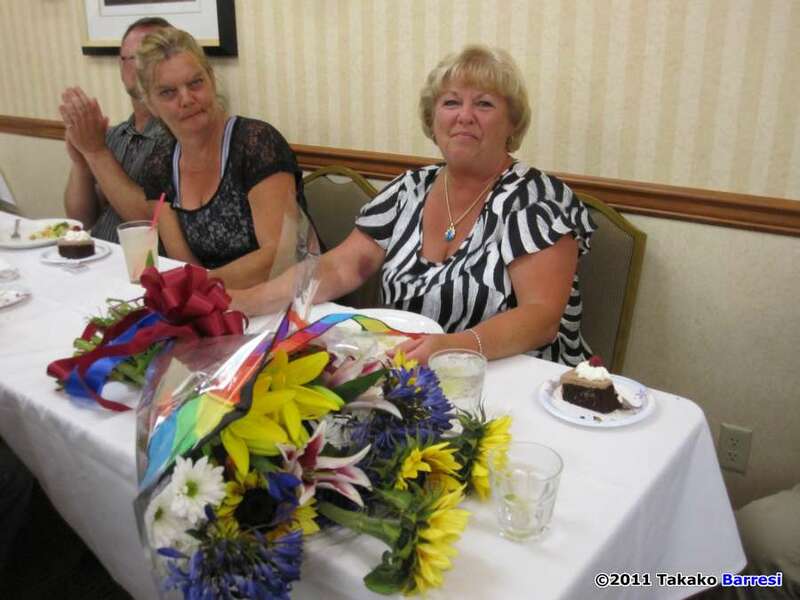 Assuming life and mobility and sufficient funds – You BETCHA!!! Will I see YOU there? Well, I sure hope so! 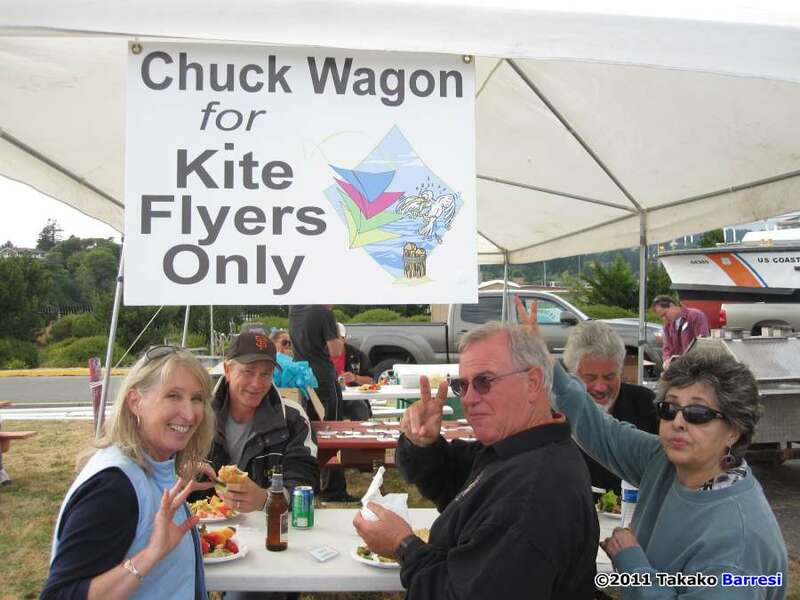 There’s gotta be at least two of us there to listen to Arnold yak over the field, so see all of the gorgeous demos and presentations, to thank Peggy Freeman for all of the efforts of the organizing committee, to intentionally pay too much for items at the Banquet auction, and to enjoy the entire 20th Southern Oregon Kite Festival show! I’ll just meet you on the flying field on Friday afternoon, and well make a fine weekend of it together, all right? 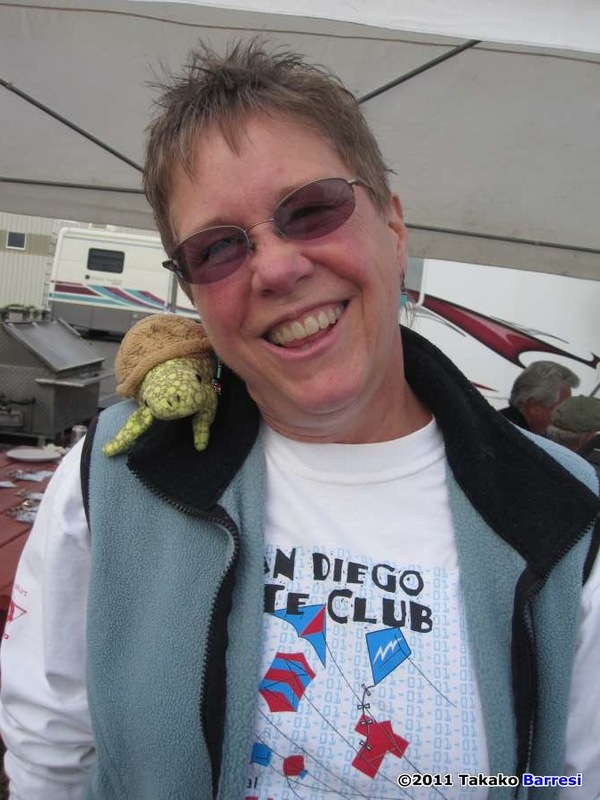 This entry was posted in 2011, Issue 79 (Jul/Aug), KL Archive and tagged brookings, festival, iquad, too much fun.